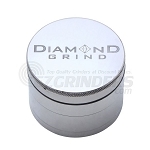 The Diamond Grind aluminum grinder is a premium brand grinder built to the highest quality. It has an anodized aluminum design that resists wear and tear over time so you don;t need to constantly replace your grinder. It comes with a stainless steel sifting screen, a bottom storage space, a centered magnet that helps seal the top to avoid spilling, a black velvet carrying pouch, and a triangle scraping tool that will get any material that sticks to the side of the grinder leaving none to waste. 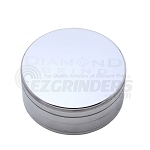 The large size is 62mm (about 2.5 inches) giving you more than enough space to grind a lot of material at once.